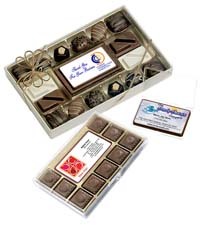 You can order through the website, by e-mailing info@chocolatecandids.com, or by calling 631.559.8199. Please allow ample time to produce large orders. Thank you for your business. We look forward to serving you! All orders must be paid in full prior to processing. Looking for that unique corporate gift that's sure to get noticed? Maybe a unique idea for your upcoming trade show, corporate party, or awards ceremony? In sales? How about self-promotion? If you're like most, and tired of the same old gifts and promotional items each and every year - coffee mugs, pens, letter openers, etc., then you've come to the right place. Welcome to the wonderful world of customized chocolates by Chocolate Candids! The most unique and best tasting personalized gift ideas you've ever seen. Our patented process allows us to personalize chocolate confections for your event or occasion using quality photos, logos, graphics or personal messages. Completely customized by you! The result... 100% edible, fun, and delicious gifts and favors that will have them talking. "Plus, who doesn't like chocolate?" FORGET ABOUT THE ORDINARY...IT'S TIME FOR THE EXTRAORDINARY! Ideal for trade shows, self promotion, business gifts, corporate gifts, corporate events and much more.